I loved Pacific Rim. The tone and writing were great fun, the jaeger designs were creative and well-realized, and the action intense. 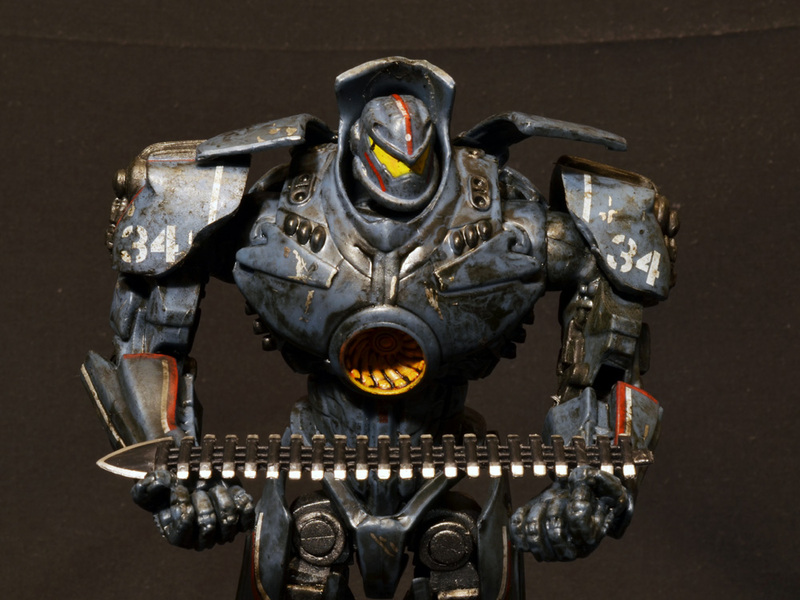 What could be a more perfect film to get awesome, highly detailed and well-made action figures? 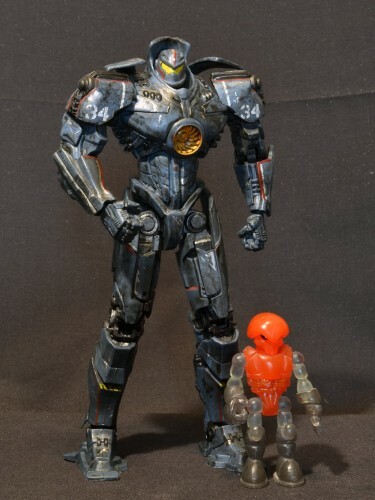 Well, at least NECA got it half right. 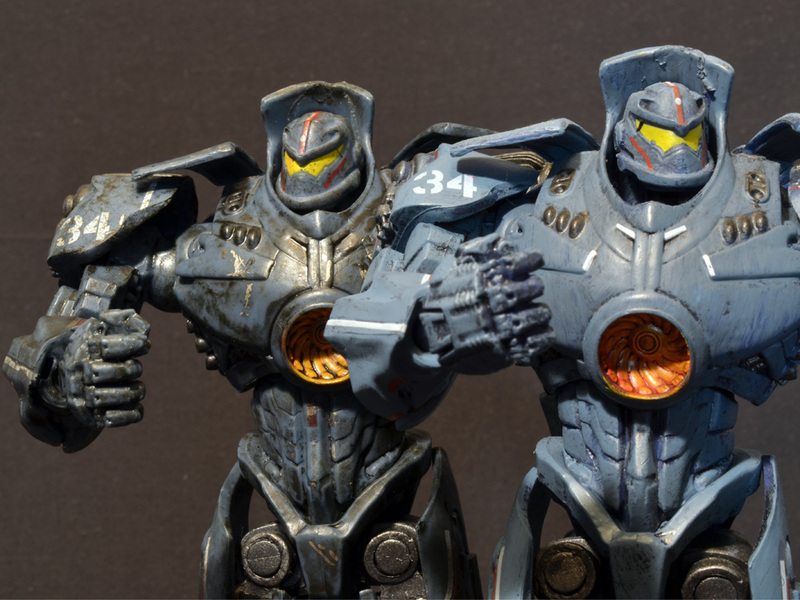 Wave 2 of NECA’s popular Pacific Rim line consists of two brand new figures and a retool/repaint, Battle Damaged Gipsy Danger, reviewed here. Stay tuned for reviews of the fearsome kaiju Leatherback, and the intrepid jaeger Striker Eureka. 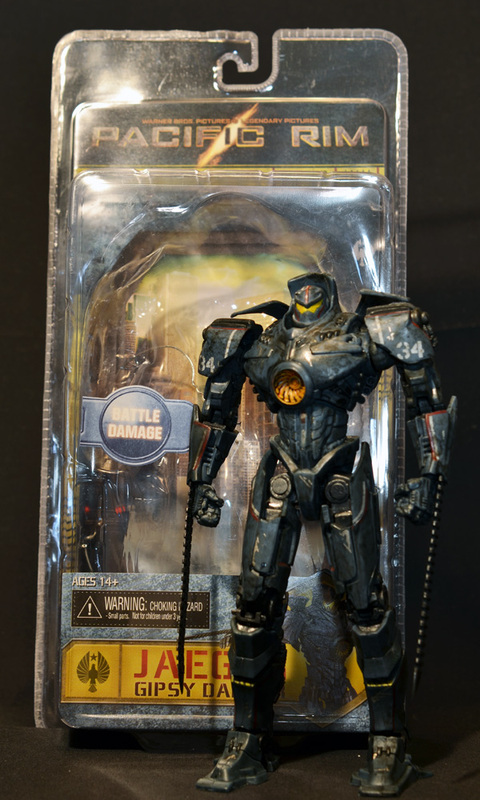 Battle Damaged Gipsy Danger comes in NECA’s standard head-sealed clamshell packaging. The art and package design is okay, but unspectacular. As always, these clamshells are a nightmare to open, requiring hefty scissors or a box cutter, leaving exceedingly sharp edges in the plastic. 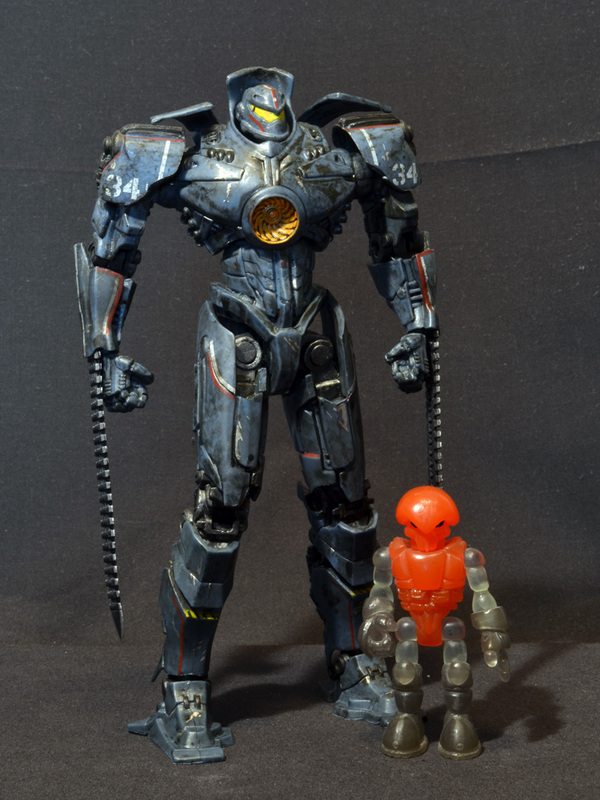 Out of his vacuum formed prison, Gipsy Danger stands about eight inches tall, shown here next to CollectionDX’s standard scale mascot, Wraith Pheyden from the Glyos toy line. Gipsy Danger is cast in dark blue plastic with black and silver mechanical details and covered in a thick layer of black wash meant to represent grime and battle damage. The wash is thick, gloppy, and unevenly applied. The whole toy is made of slightly gummy PVC plastic, making the details thick and clunky. 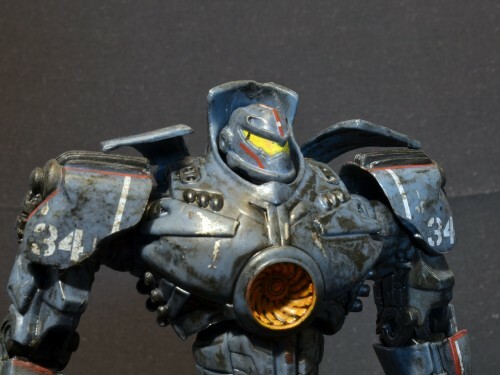 The face is pretty well painted this time around, much cleaner than the Wave 1 Gipsy Danger release. Most of the red trip and the white printed markings are cleanly applied, with any errors covered by that thick black wash. 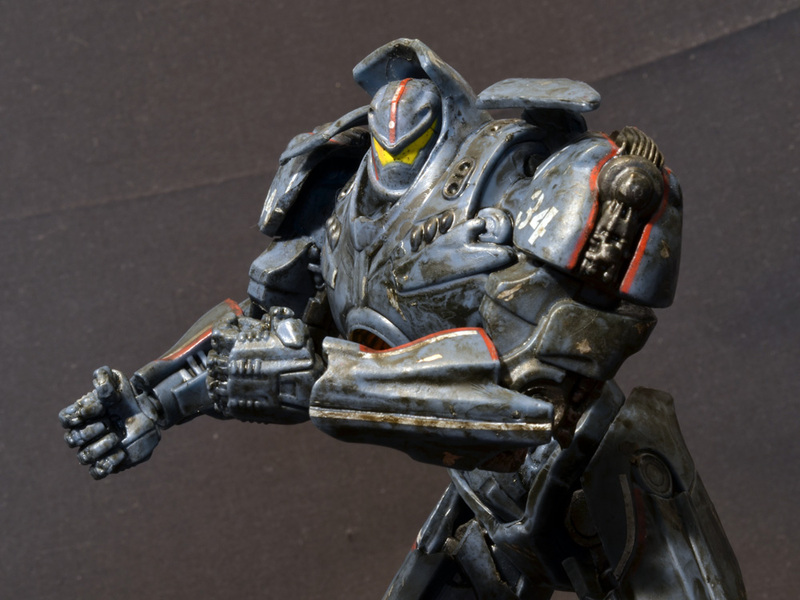 The mechanically details are convincingly painted with a silver drybrush over black. There is some slop around the edges, but again, much can be forgiven thanks to the heavily washed and weathered look of this version. Articulation is exactly the same as on the first version. The shoulders are still hindered by their sculpt and the detail on the back, and most of the other joints have similarly limited ranges of motion due to the sculpt. 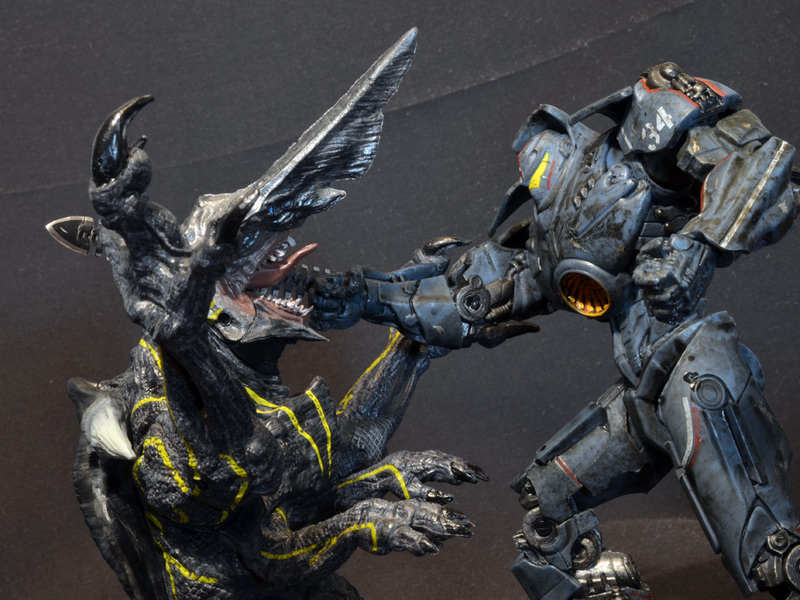 Still, Gipsy looks good with those big meaty kaiju-punching fists. Comparing the battle damaged version to the Wave 1 Gipsy Danger is pretty dramatic. The first version was painted blue with some shading and a much lighter color overall. 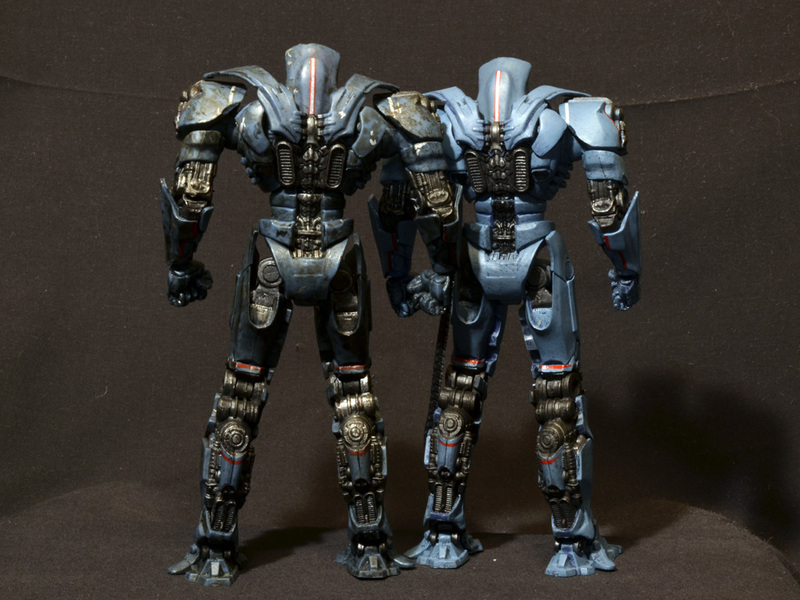 The battle damaged version is cast in blue plastic with the details and weathering applied directly over top, giving the toy a darker and cheaper look. Even under all that black sludge, the battle damaged version’s blue color is more uneven than the nice painted blue of the clean version. The only other difference besides the paint between the two versions is on the wrist. The battle damaged version has a slot near each fist for the new swords to attach. The swords are made from a softish black plastic with silver paint cleanly applied to the cutting edge. Two swords are included, but one of mine broke almost immediately. 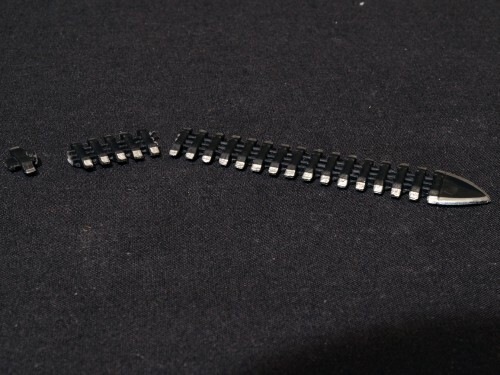 The tabs on the swords that slide into the forearm are not very snug, and while trying to make sure the sword was secure, it buckled and broke into multiple pieces. The plastic was much more brittle than I was expecting, so be careful if you decide to pick one up. 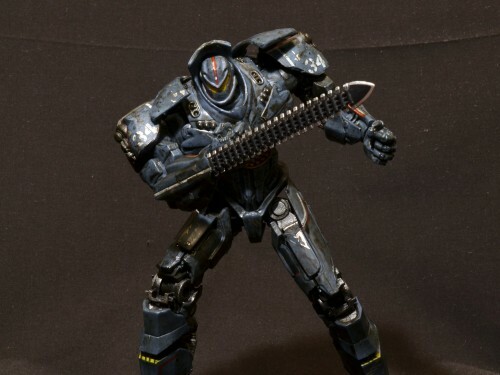 The swords do add a certain level of battle-readiness to Gipsy Danger. They certainly made for one of the more dramatic scenes in the film. With the shoulder limitation, Gipsy can only do so much with those swords, but the toy can still do some pretty great poses. Unfortunately, the swords also do not fit very securely, so I had to reattach the one remaining blade after pretty much every pose. 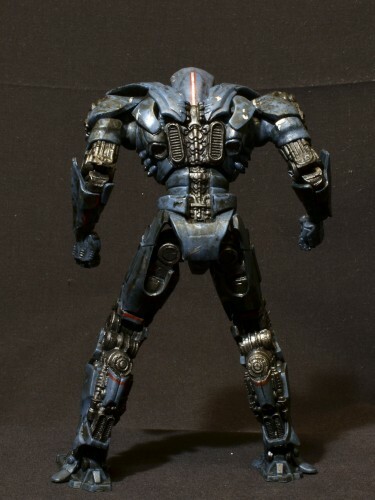 Gipsy Danger looks great doing these down low shoulder-tackle poses. 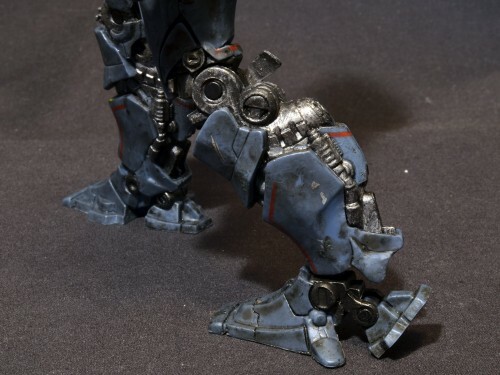 By leaning the figure over more, you can get around the limited hip motion caused by the armor plates there. 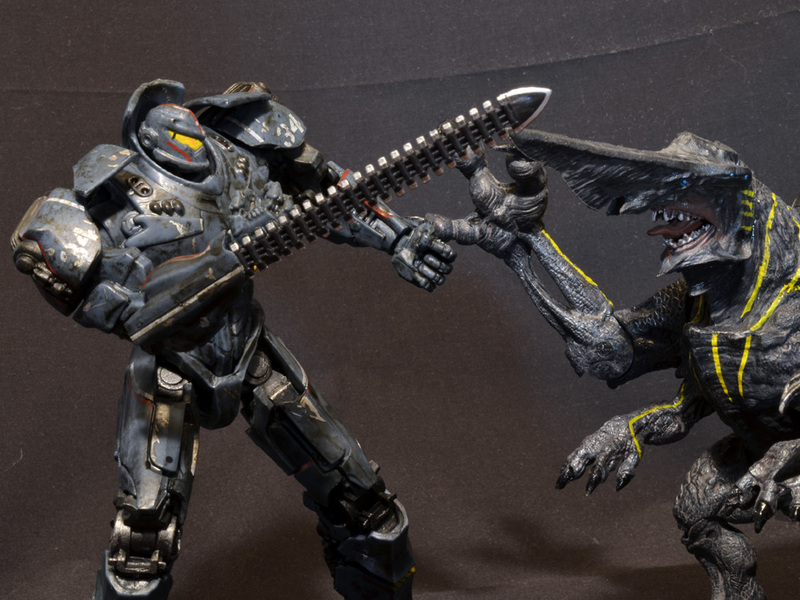 You can’t have a battle-ready monster killing jaeger toy without posing it with its kaiju foes! 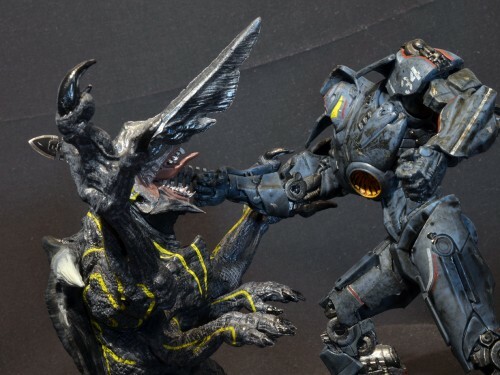 Putting the (relatively) dynamic Gipsy Danger figure next to Knifehead makes it that much more obvious how static and poor the kaiju figures in the line are. 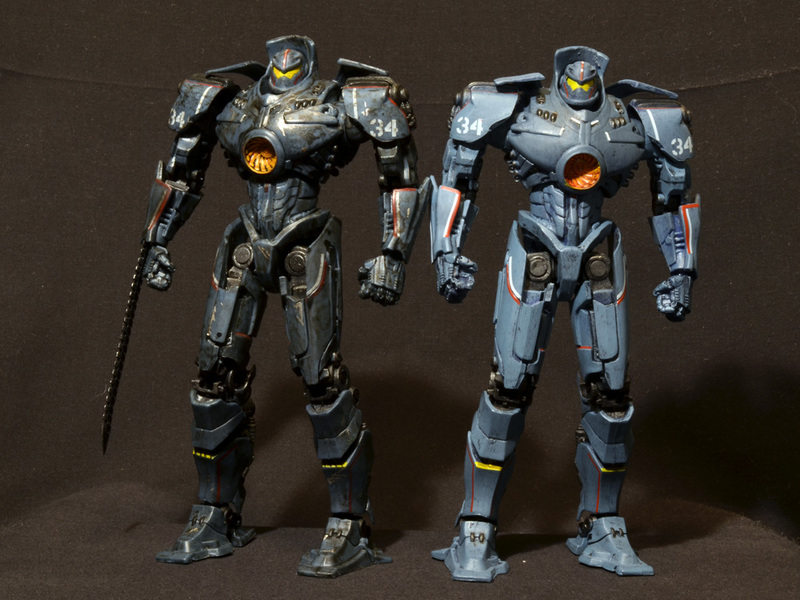 NECA’s Pacific Rim toys retail for $18.99 each. 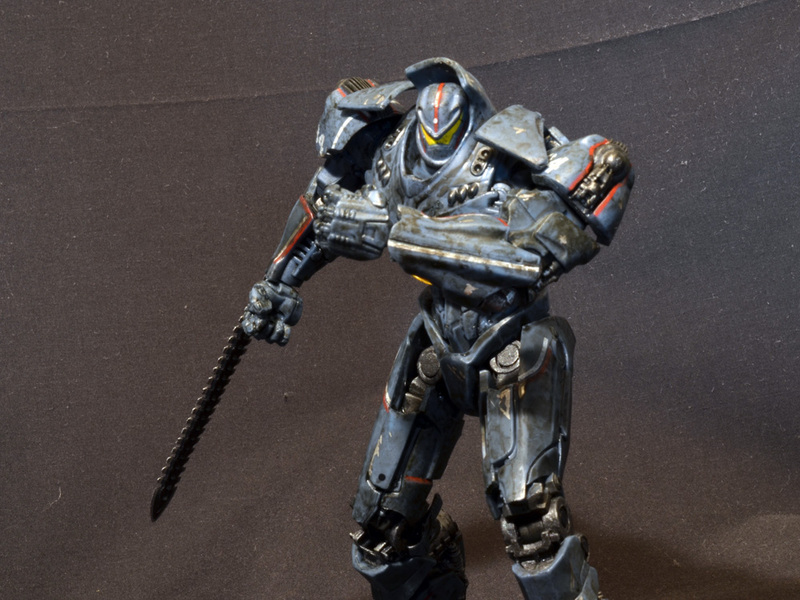 Action figure prices have crept up quite a bit in the past few years, but twenty bucks for a mass market figure is not an insubstantial amount of money. For twenty bucks, the paint should be better and parts of the toy should not break out of the box. 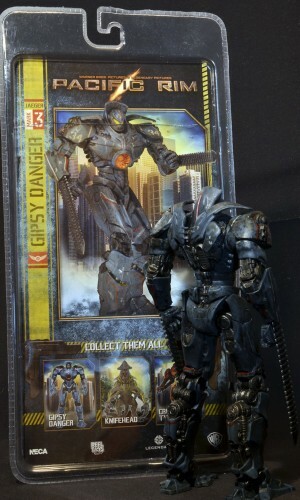 The original Gipsy Danger figure sold out almost immediately and commanded high aftermarket prices in light of Pacific Rim’s popularity, and in general, the Battle Damaged Gipsy Danger is a decent substitute. Still, the weathering is ugly, the articulation is not great, and parts broke. Pacific Rim fans (myself included) have been eating these toys up because there are no alternatives, but action figure collectors deserve better. I don't understand why the swords are mid transition. I would have preferred smooth blades to these. I'm just hoping there's a better articulated 2.0 in the cards next year. I think we have to wait and see what the reception is to series 3. That’s the first one that won’t have the taint of NECA’s misadventure with Walmart on it. My hunch is Cherno Alpha is going to be a masterpiece. You are right about the swords. They deploy as segments, but then slide together to form a solid blade. 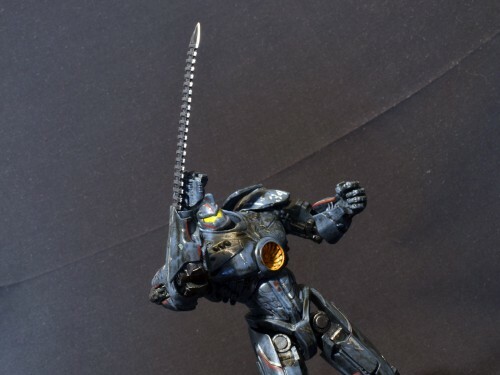 That would have looked better AND been less fragile… even the 18" Gipsy has the weird segmented sword. I hope Wave 3 is better, too. I don't expect we'll see re-dos of the existing bots, but I really want Cherno and Coyote to be amazing. I’m sure they went with the segmented sword because they thought it seemed cooler than straight swords. I think a bendy chain might have been better. I think they might re-do Gipsy Danger, at least. They’ve done multiple versions of the Jungle Predator, Alien warrior, etc. and a gypsy with alternate plasma cannon hands, maybe?? ?